Come along for an imagination extravaganza! 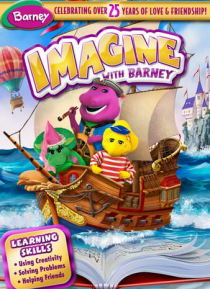 Join Barney and his friends as they use their imaginations to visit places near and far, and explore their creativity through drawing, song and dance! The dinos explore a tropical island paradise when they bring a painting to life, and go for a ride when they build their very own bus and airplane using imagination and teamwork! The dinos always know how … to have a tee-rific time with creativity and good friends!